the one thing we seldom hear about is the number of deaths of elderly during winter time who has been forgotten by their children, who lives on their own in this cold back rooms and garages, who mostly suffers because they do not have warm clothing and bedding most have illnesses such as arthritis, which is already very painful and gets worse with the cold, they will roll up in balls and just try and keep warm ending up not to be able to get up and find something to eat, most not having a proper meal to start with resulting in them getting weaker and weaker. Winter is a beautiful season but a dreadful one for all destitute families, children and elderly, it’s the longest 3 months of your life if you have no warm clothes, no warm bedding, live in a room with raw cement floors, holes in your roof and still on top of this you have to fight off the hunger that overcomes you, where can they find the strength that they need to overcome all of this? We need to be the change, we can give them the strength we can lift them up by providing blankets, warm clothing and warm food, please help us to make this difference in the lives of the ones who suffers so much already. 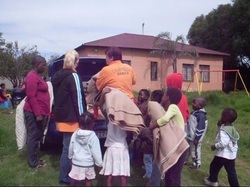 The children, families and elderly that we assist is located across South Africa. We believe in making our elderly feel special and to have them live a happy and blessed life for the time they have left on earth: they are our past, and without our past, there would have never been a future. We also make homemade vegetable soup / stews and warm meals on a regular basis to provide for the elderly in homes and for the elderly who are homeless as well as giving blankets and winter clothing to the elderly in homes and to the children and families who are destitute. Winter Care Packages for our destitute. ~ One day flu Remedy. ~ Each individual and homeless person will receive a set of, winter gloves, scarf and winter cap and track suit. Every family / elderly and individual will receive extra food for winter time. We will try our utmost best to ensure that we collect enough blankets and winter clothing for all the needy on our list for aid as well as the homeless.